Elephants can do Maths – FIREPAW, Inc. The results of a new animal cognition study have demonstrated that Asian elephants have math skills similar to humans. Asian elephants demonstrate numeric ability which is closer to that observed in humans rather than in other animals. This is according to lead author Naoko Irie of SOKENDAI (The Graduate University for Advanced Studies and the Japan Society for the Promotion of Science) in Japan. In a study published in the Springer-branded Journal of Ethology, Irie and her colleagues found that an Asian elephants’ sense of numbers is not affected by distance, magnitude or ratios of presented numerosities, and therefore provides initial experimental evidence that non-human animals have cognitive characteristics similar to human counting. In this study, the researchers aimed to replicate the results of previous research that already showed that Asian elephants have exceptional numeric competence. Irie and her colleagues developed a new method to test how well the animals can judge relative quantity. 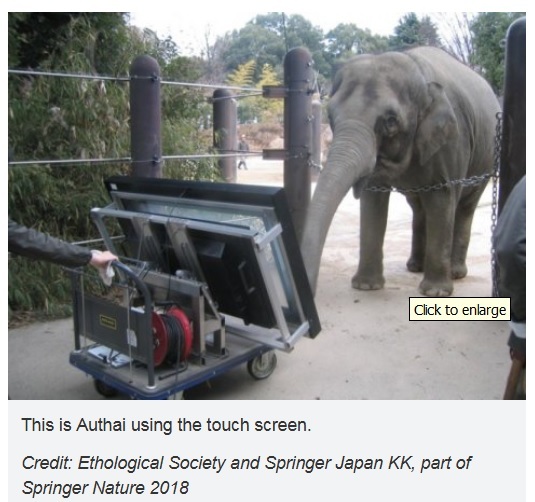 They successfully trained a 14-year old Asian elephant called Authai from the Ueno Zoo in Japan to use a computer-controlled touch panel. The programme was specifically designed to examine the cognition of elephants, so that any unintended factors potentially influencing the results could be ruled out. Authai was presented with a relative numerosity judgment task on the screen, and then had to indicate with the tip of her trunk which one of the two figures shown to her at a time contained more items. These ranged from 0 to 10 items, and contained pictures of bananas, watermelons and apples. The fruit were not all presented in the same size, to ensure that Authai did not make her choices purely on the total area that was covered with illustrations per card. Next Yes, your pet can tell time! Pingback: Elephants can do Maths – FIREPAW, Inc. | "OUR WORLD"